Having been an Access guru until 2004 and then not really doing anything with it since, it has been joyous recently to get drawn back into the world of Microsoft's desktop database. There have been a lot of changes since 2004 though, mostly for the best. Even the changes that are not so good (the demise of user-level security, for example) I can understand - Microsoft want to push developers who need user-level permissions towards other platforms, like SQL Server. But I digress. Doing Access development again has been fun, and I found myself thinking about global variables on the way into work this morning. What are they, and where should you put them? Create a table and store it there. Create a table called USysMetadata (and watch how prefixing a table with USys ["user-system"] hides it from default users) with two columns, MetaName and MetaValue. Store the name of the global variable in MetaName and the value in MetaValue. Easy, right? But which approach to use, when? Especially when both have their advantages. The module approach is better for performance, especially if your database is deployed compiled (MDE or ACCDE). Retrieving variable values from USysMetadata might typically involve a DLookup("MetaValue", "USysMetadata", "MetaName='YourVariableNameHere'") or some SQL, neither or which is so fast. But on the flip side, if you need to add more global variables, well, you can't do that in a multi-user environment so easily for the basGlobal approach, since you need exclusive access to make design changes. By contrast, to add more using USysMetadata, just add a new row to the table. Couldn't be easier, and exclusive access is not required. The other difference here is that USysMetadata allows variable values to be retained after you've logged out - basGlobal doesn't allow this. For global constants (i.e. not variables) use basGlobal for performance. For session variables (i.e. that don't need to be retained between log-ins) use basGlobal for performance. For true system variables (i.e. that can be set and read by all users and/or that need to be retained across sessions) use USysMetadata for flexibility. It's nice to be back, offering up my Access two penn'orth, even if no-one reads it. If you use a Startup form instead on an AutoExec macro, place the VBA code needed for that form in the form's module instead of a standard module. Since Access has to load your Startup form, it will automatically load that form's module, which is generally faster than loading a standard module. This technique gives your application the appearance that it is loading faster. Minimize the amount of code in your startup form. You may want to defer certain operations, such as opening data access objects in code, or checking objects to a later time. Again, this gives the impression that your application is loading faster. ActiveX controls can take longer to load than other controls and will subsequently slow down the load time of your application. Close forms that aren't being used. Every form that is open consumes memory that could be used by other parts of your applications. Consider opening your application's most commonly used forms when your application starts. Set their Visible properties to False, and then make the Visible as needed. This front-loads some performance hits to the application load event, making forms load faster when needed. If a form's record source contains a large number of records, and the form is primarily used to add new records, set the DataEntry property of the form to Yes. This precludes Access from having to retrieve existing records when the form loads. Avoid sorting records in a form's underlying record source unless a particular presentation order is absolutely necessary for the form. This will make the form load faster. Consider basing forms and subforms on queries rather than tables. By doing this, you can use the query to restrict the number of fields returned, making the form load faster. Consider replacing VBA in a form's module with calls to standard modules, or with hyperlink objects. Then set the form's HasModule property to False. This turns the form into a 'lightweight' form, making it load faster. Try indexing all fields in the subform that are linked to the main form. Also index all fields in the subform that are used for criteria. Set the subform's AllowEdits, AllowAdditions, and AllowDeletions properties to No if the records in the subform aren't going to be edited. Or set the RecordsetType property of the subform to Snapshot. In the RowSource property of listbox and combobox controls, include only the fields that are necessary. Index both the first field displayed in a combobox or listbox, and the bound field. Set the AutoExpand property of comboboxes to No if you don't need the "fill in as you type" feature. In a combobox that has the AutoExpand property set to Yes, the first displayed field should be of type Text rather than Number data type. In order to find matches, Access needs to convert numeric values to text. If the data type is Text, this conversion can be skipped. If the bound field in a lookup combobox is not the displayed field, don't use expressions for the bound field or the displayed field, don't use restrictions (the WHERE clause) in the rowsource, and use single-table row sources wherever possible. If a the data that fills a listbox or combobox does not change often, and that data comes from a linked table, consider moving that data's table into the database. This can be a huge performance boost, especially if the linked table is located on a network drive. Minimize the number of controls on your form. Loading controls is one of the biggest performance hits when loading a form. Consider grouping controls on multiple pages. When the form loads, prepare only the controls on the form's first page. Defer operations on other page's controls, such as setting the record source until the user moves to that page. This makes the form load faster. Close forms that contain unbound OLE Objects when they are not in use. When you activate unbound OLE objects, the memory used in that operation is not released until the form is closed. Where possible, convert subforms to listbox or combobox controls. It is far quicker to load a control than it is to load an additional form as a subform. You can reduce a form's load time by moving its code from the form module to a standard module. When the form loads, the form's module doesn't need to be loaded. Of course, the standard module needs to be loaded at some point, but once a standard module is loaded, it stays in memory until you close the database. Set only the properties that absolutely need to be set. Properties assignments can be relatively expensive in terms of performance. Review your form's startup code to ensure that you are not setting any form or control properties that don't need to be set. Use the Requery method instead of the Requery action. The method is significantly faster than the action. Give the user some visual feedback during long operations. Consider using status meters to display a task's progress. At a minimum, use the Hourglass cursor along with a status message. This won't make your application any faster, but it be perceived to be doing something - this counters perceived slowness! If you have databases from old versions of Access that used OLE custom controls for tabbed dividers, replace them with the native tab control found in Access 97 and above - it loads and runs faster. Hyperlinks in label controls make it easy to open another Access object. Instead of placing command buttons on your forms to do common operations, investigate the possibility of using a label control with Hyperlink properties. This approach eliminates the need for a command button, and its associated event code. Consider using multi-page forms, separated by the page-break character. This allows you to present only the controls needed, and can reduce form-load time. For example, if your form has 10 combobox controls that take along time to fill, split the form into multiple pages using the PageBreak control. Then, pick the 5 combobox controls the user is most likely to use and place them on the first page. Place the remaining controls on the second page. Load time for the form should be substantially reduced, especially if the queries filling those combo box controls are complex. In Tools, Options, General, uncheck "Track name AutoCorrect info". You'll find huge improvements in the time it takes your database to do virtually anything. Note that this function (which cascades changes you make to object names) can be useful in a development environment, but should be turned off in a production environment. Compact and/or repair your database regularly (in Access 2000 and above, one action does both). Compacting your database reclaims unused space and makes nearly everything faster. Also, compact anytime you import/delete objects in your database, or compile and save VBA code. If you find this an onerous chore, investigate admin scheduling tools like the Handy Access Launcher. And don't forget to compact your MDW files sometimes too! 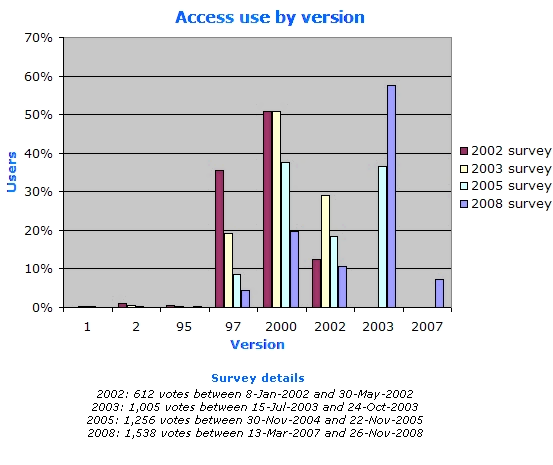 Access has its own performance analyzing capabilities (Tools, Analyze, Performance). Select All Objects Types, check Select All and hit OK - Access will recommend optimization techniques for anything and everything in your database, which might give you some ideas. Be wary of implementing too many indexes though - Access is forever recommending them and you might have good reasons not to put too many in. Threads: the number of operating system threads available to the Jet database engine. MaxBufferSize: the data buffer used by Jet. UserCommitSync: tunes the performance of explicit transactions. ImplicitCommitSync: tunes the performance of implicit transactions. FlushTransactionTimeout: tunes the performance of asynchronous write operations. ExclusiveAsyncDelay: tunes the performance of asynchronous mode writes to exclusively opened databases. SharedAsyncDelay: tunes the performance of asynchronous mode writes to databases opened for shared access. PageTimeout: the delay for checking other user's changes to the database. LockDelay: how long Jet waits between retries on locked pages in a shared database. MaxLocksPerFile: the maximum number of locks can be placed on a database. RecycleLVs: determines how memo, OLE and hyperlink data pages are recycled. Now I don't pretend to know the best settings for all of these, and if you're unsure you're advised to leave the defaults alone (this is good advice for any changes you might ever make to any part of the Registry). But if you do want to experiment, these keys can be found in HKEY_LOCAL_MACHINE\SOFTWARE\Microsoft\Jet\4.0\Engines\Jet 4.0 (for Jet 4) and can be edited either with RegEdit or, if you're familiar with good old DAO, the DAO SetOption command in VBA (or SaveSetting in later versions of Access). Don't forget to back-up the Registry before you start experimenting. You can improve performance (and simplify maintenance) by splitting your database in two. The "application" front-end (FE) of your database holds all objects except tables, and is linked to the "data" back-end (BE) that contains the actual tables. This can give particular gains in a multi-user, networked environment, as the FE can be installed on each user's workstation with only the BE on a server. Later versions of Access even have a wizard to help you make this split (Tools, Database Utilities, Database Splitter). Avoid lock conflicts by experimenting with the Refresh Interval, Update Retry Interval, Number of Update Retries and ODBC Refresh Interval Settings - you'll find these in Tools, Options. If you are opening a database that no other users need to use, open it in Exclusive mode. To do this, check the Exclusive checkbox in the Open Database dialog.